Merry Christmas! If you celebrate the holiday I hope you have a fun day planned with family and friends. As usual Christmas morning in my house will begin with Cecil tearing into his gifts. He’s on the very good boy list this year and will be getting quite a few fun new things :). Actually, we did our shopping for him a little late this year (aka yesterday) but I still got all his gifts wrapped in time. I put them in tissue paper so he can rip into them himself. Merry Christmas, Kristina!!!!!!!!! 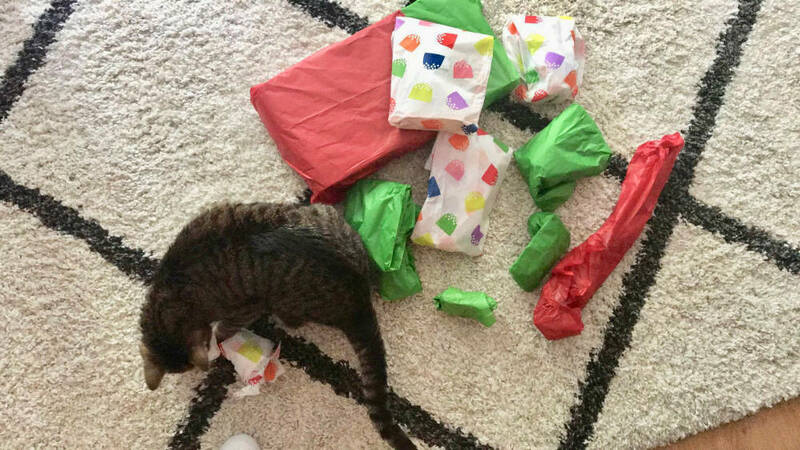 Cecil is a special baby who deserves presents all the time. Does he like his gifts? I got the cats a new special wet food that they LOVED, even Jelly! It was Newman’s Own. I’m getting them some more today. I also got them a squirrel to play with.